SeeYou now integrates with the skysight.io weather app as well as TopMeteo and will suggest tasks based on either weather forecast. Note that skysight and TopMeteo subscriptions are not included with SeeYou. Run SeeYou on your ipad, iphone or any Android device all under one license. SeeYou synchronizes with the SeeYou cloud allowing instant access to all of your flights from any device. SeeYou flight planning and analysis software is the gold standard when it comes to gliding software and is the most popular program in North America. It can be purchased online directly from the Naviter Website or through Fox One Corp for the same price. The only difference is when you purchase it from me, I get credit for the sale! 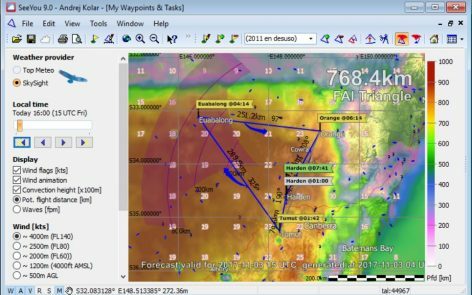 Improvements in Release 8 include a built-in weather display using the very popular Top Meteo soaring forecasts. While Top Meteo is new to North America, it has been in use in Europe for many years. The Top Meteo weather overlay in SeeYou 8 and 9 allows you to plan tasks directly over the weather forecast. It will also go through all of your saved tasks and show you the longest task that can be flown in each of the next three days. Top Meteo is a subscription based weather service with an annual fee of $99 US and covers all of the US aswell as the Ontario and Quebec regions in Canada. See more details about Top Meteo on their website. The SeeYou turnpoint module can be used to manage all your turnpoints and to create new turnpoints by clicking anywhere on the map. The FAI sector overlay is a great help when planning badge or record triangles and shows you where the turnpoint needs to be to meet the FAI triangle definition. Don't have a point there, add it with a click of your mouse!